At Google I/O, we announced our ongoing investment in Blockly with the release of a native Android version. We also highlighted significant improvements to the performance of web Blockly, which enables better rendering performance on mobile devices. 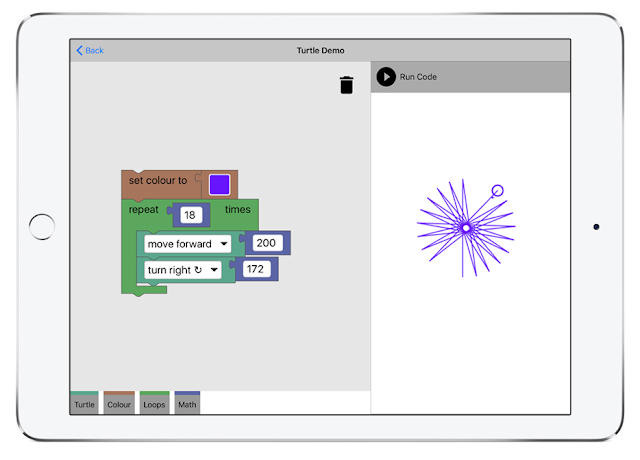 Now iOS developers will have access to an open-source developer preview of Blockly for iOS that supports building better experiences on mobile, including multi-touch and enhanced animations as new experimental features. Today’s release supports our ongoing efforts to enable developers to create consistent, high-quality, beginner programming experiences - as block-based programming interfaces can make coding more accessible by removing syntax errors and supporting “tinkerability.” We believe that coding is more than just a set of technical skills; coding is a valuable tool for everyone, empowering users from around the globe to imagine, invent, and explore. With Blockly for iOS, developers can add Blockly views and fragments directly into their iOS app. This will offer tighter integration and improved performance compared to using a WebView. In this developer preview, blocks are currently optimized for tablets, but ready to customize for any app. In addition, if you already use Blockly we're releasing a major update to the tools for creating custom blocks and configuring Blockly for your app, check out the new Blockly Developer Tools. The new tools allow you to edit and maintain a library of custom blocks, quickly configure toolboxes, and export and import files to local storage. Click here to learn more, and get started on Blockly for iOS today. And to share feedback and get news, we welcome you to join the Blockly mailing list. We look forward to seeing your future builds!